This week's most expensive NHL game will come courtesy of the New York Rangers, who host the Carolina Hurricanes at Madison Square Garden on Saturday. The Vancouver Canucks, Chicago Blackhawks and Pittsburgh Penguins also set to welcome top-priced games through the end of the week. With the Rangers soaring to the top spot in the Metropolitan division, it comes as no surprise that Midtown Manhattan has hosted a slew of this season's most expensive games through the quarter pole. Saturday's matchup with the Hurricanes will be the latest, with Rangers tickets at Madison Square Garden now averaging $336 and the get-in price starting from $139. Heading Northwest, the Canucks will take on the Toronto Maple Leafs in the week's second most expensive game on Saturday. With the Maple Leafs holding their own in the Atlantic division, they'll bring a big price premium with them when they hit Rogers Centre this weekend. Canucks vs. Maple Leafs tickets currently average $306 and the cheapest tickets are going for $117 each. The Blackhawks are amidst a turbulent 5-3-2 10-game stretch, but that hasn't affected ticket demand on the secondary market at United Center. They'll host the Jets on Sunday, where Blackhawks tickets on the resale market currently average $216 and the cheapest tickets start from $76 each. The Jets are looking to avoid falling into the basement of the Central division, where the Colorado Avalanche currently sit at 9-11-1 on the season. The defending champion Penguins head home to take on the Detroit Red Wings on Saturday. 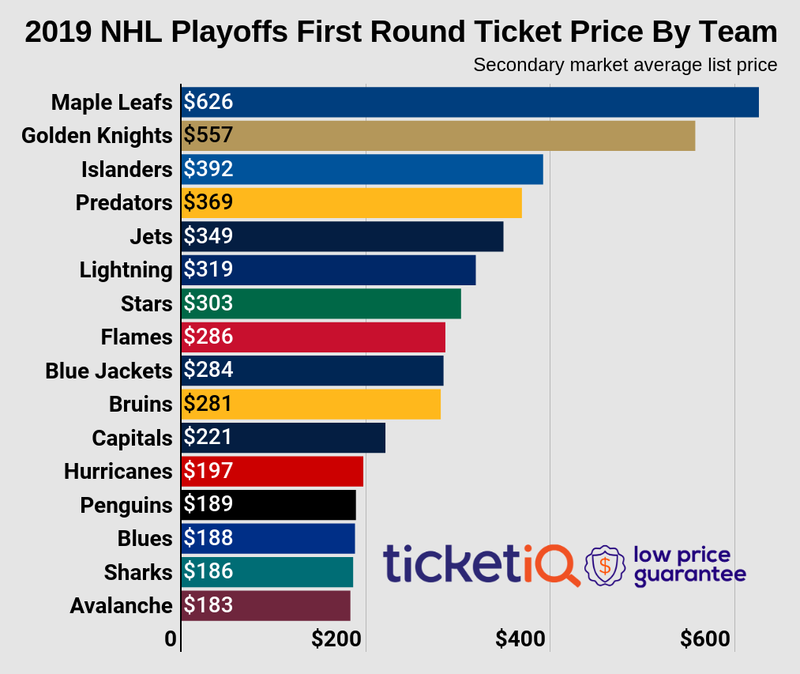 As the fourth most expensive game of the week, Penguins tickets at PPG Paints Arena currently own a secondary market average of $192 and the get-in price starts from $66. The Penguins find themselves on the coattails of the Rangers in the Metropolitan division at 13-6-3 entering Wednesday's matchup with the New York Islanders. The Red Wings, meanwhile, enter Wednesday in second-to-last place in the Atlantic at 11-10-2. The Blackhawks will round out the top-priced games this week when they host the Devils on Thursday night. Serving as the fifth priciest game of the week, Blackhawks vs. Devils tickets currently own a $177 average and $51 get-in price.